Ugh, you guys. I’ve been trying to get motivated to cook all week, and I really just couldn’t do it. 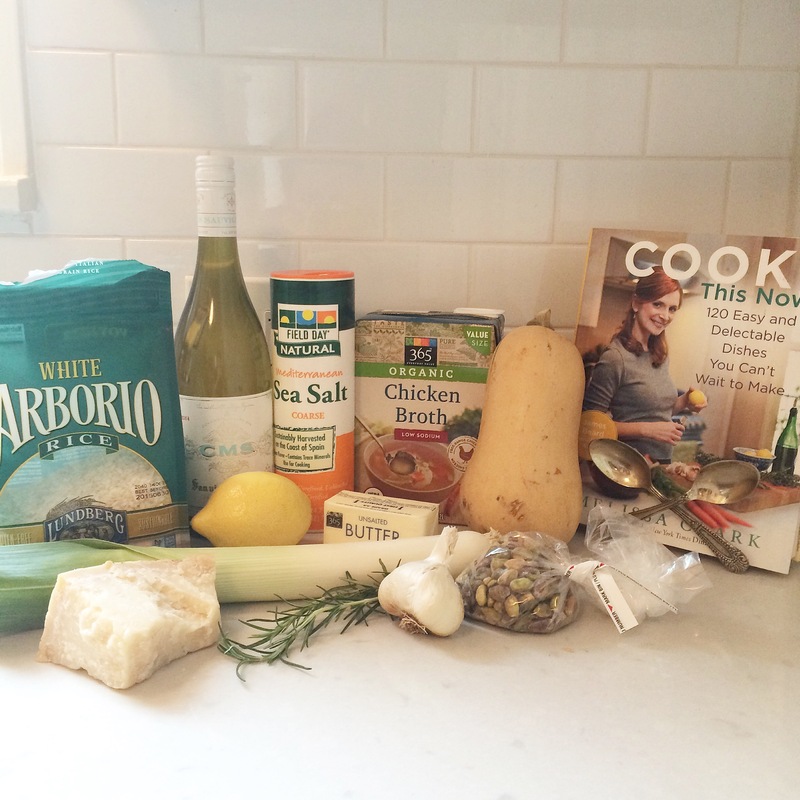 When I first started this blog, I had so many recipes I was excited to make and share. I’m not sure if I’ve made all of them or what, but here it is November, the month of roasted veggies and soups and comfort foods and pumpkin spice and basically all of my favorite things, and I’ve been completely uninspired. Yesterday I decided I would perhaps just take the month off. I mean, I had posted consistently for the past seven weeks – that’s almost two whole months – so certainly I deserved a break. But then, this morning I remembered a recipe I’ve been meaning to make for the past five Novembers now (I know that it’s five because the cookbook where it comes from was a hostess gift from my friend Lindsay, when a group of us threw her a baby shower for her little guy who turns four next week, sob!). 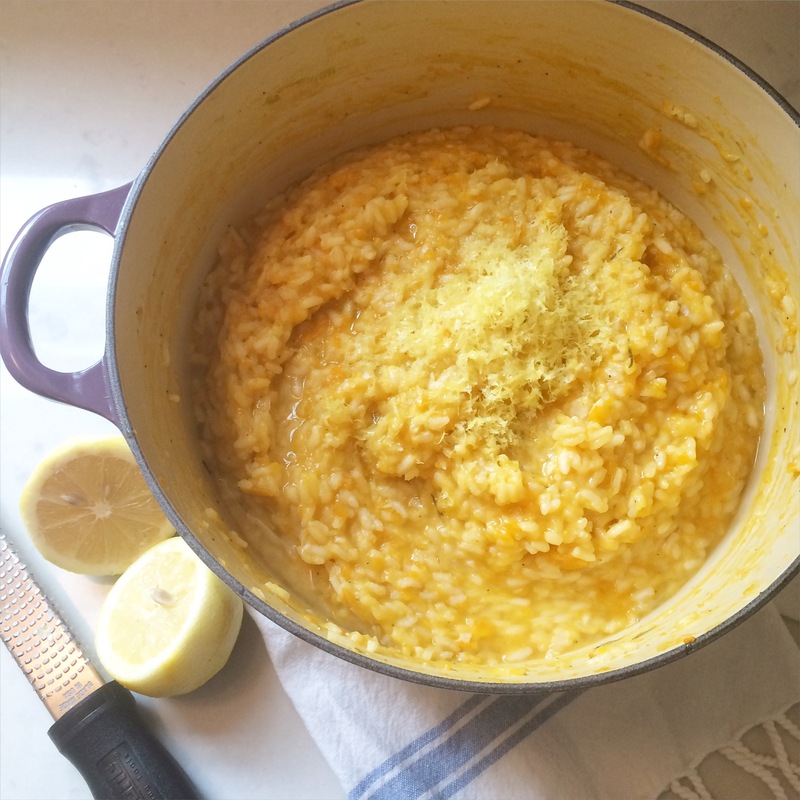 Butternut squash and risotto are two of my favorite things, so I don’t know how it’s taken me so long, but for whatever reason it has. All of the sudden I inspired not only for the blog, but for dinner too. 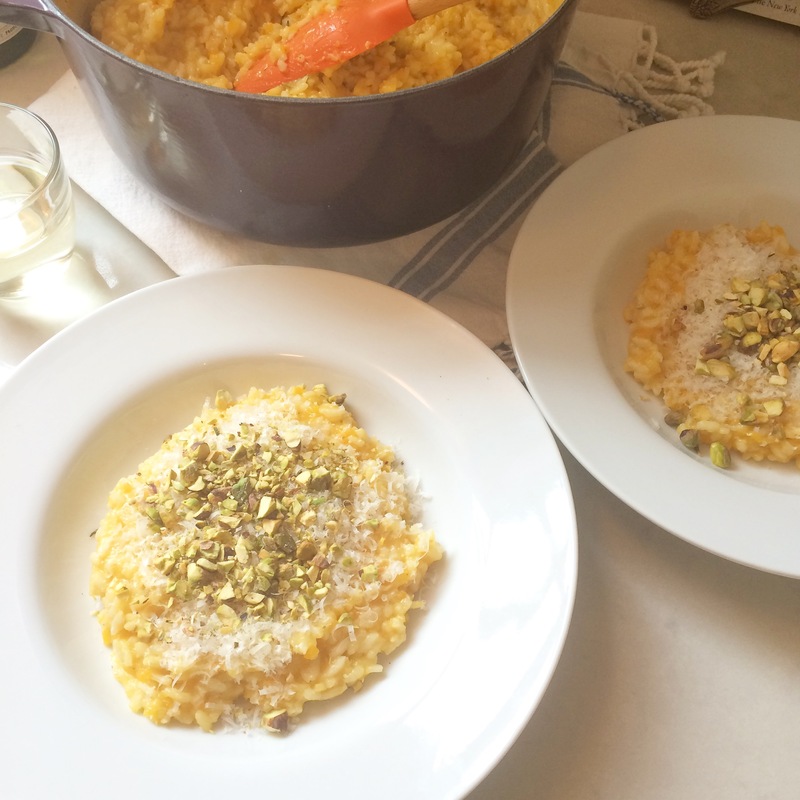 Risotto is one of those things that I think a lot of people are afraid to try at home for fear that it’s too much work. Or at least, risotto is one of those things that I used to be afraid to try at home because I feared it was too much work. While it does require a half an hour of hanging out near your stove, it’s a half hour where all you have to do is stir a pot and maybe drink a glass of wine (the recipe calls for one third of a cup, which leaves a lot of wine left for drinking). The prep time is pretty minimal – at least if you use a food processor to grate the squash – so all things considered this is a relatively easy meal to throw together. 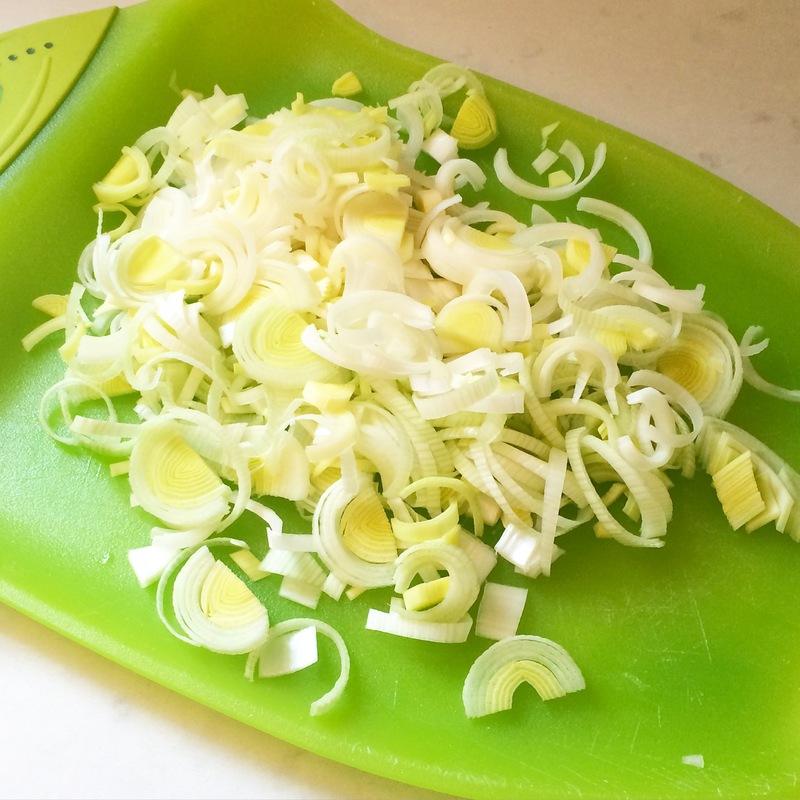 Once your squash is grated and your leek is sliced, you get to just stand by the stove and stir, chatting with whomever is in your kitchen or scrolling through your instagram feed from the day. I minced my garlic straight into the pan, and once the risotto was done cooking zested the lemon and squeezed the juice right in as well. I have a few tips, but they’re pretty minor. (1) I wasn’t sure how much half a pound of squash was, so I used two cups, the better part of the small squash I had on hand. (2) At first I found the rice was sticking the the pan quite a bit, which was why I used a little extra wine to deglaze the pan. Nothing like dumping wine straight from the bottle into a Le Cruset to make you feel like a real chef! (3) At the beginning my rice was absorbing the stock pretty quickly, so I was worried I would get through the 6 cups before the 25-30 minute cooking time, which is what happened. Although the sauce was creamy after 30 minutes, the rice was still a little crunchy, so I added a bit more stock and left it on the stove for five minutes longer, at which point it was perfect. (4) The reason the cheese is optional in the recipe as written is because Melissa’s husband doesn’t eat cheese. As such, she uses it as an optional garnish, but I stirred a bit in as well. 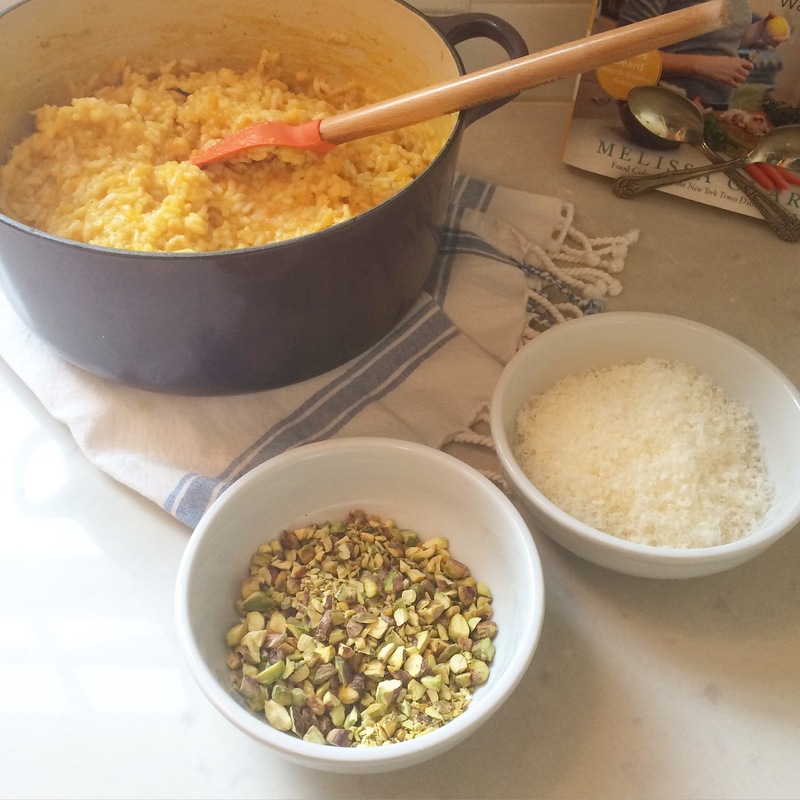 The risotto doesn’t really need it, but I find that parm makes everything better. Finally, (5), I was a little iffy on the pistachios but decided to follow the recipe to the letter for the sake of the blog (you’re welcome). They’re $$$ – even buying a small amount in bulk was $10 – and hard to chop. 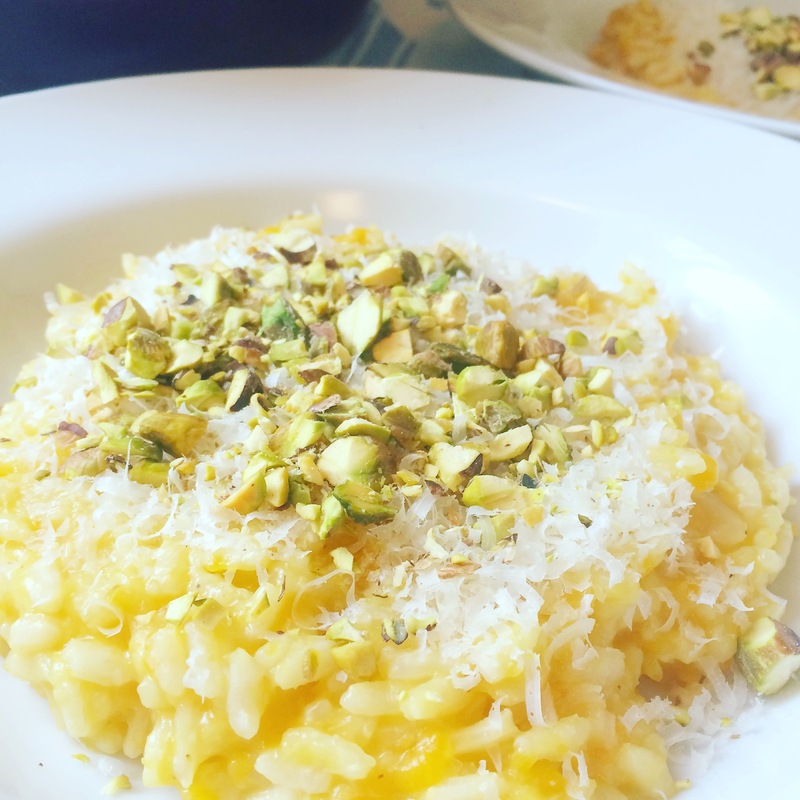 I expected I would write that you didn’t need them – but while again the risotto would be delicious on its own, I was pleasantly surprised to find that they in fact add quite a bit both in terms of flavor and crunch. OK so there you have it – my “weekly” post at 4:30 on a dreary Thursday afternoon – late, but still with enough time for you to make this for dinner tonight. Trust me, you’ll be glad you did. 1. 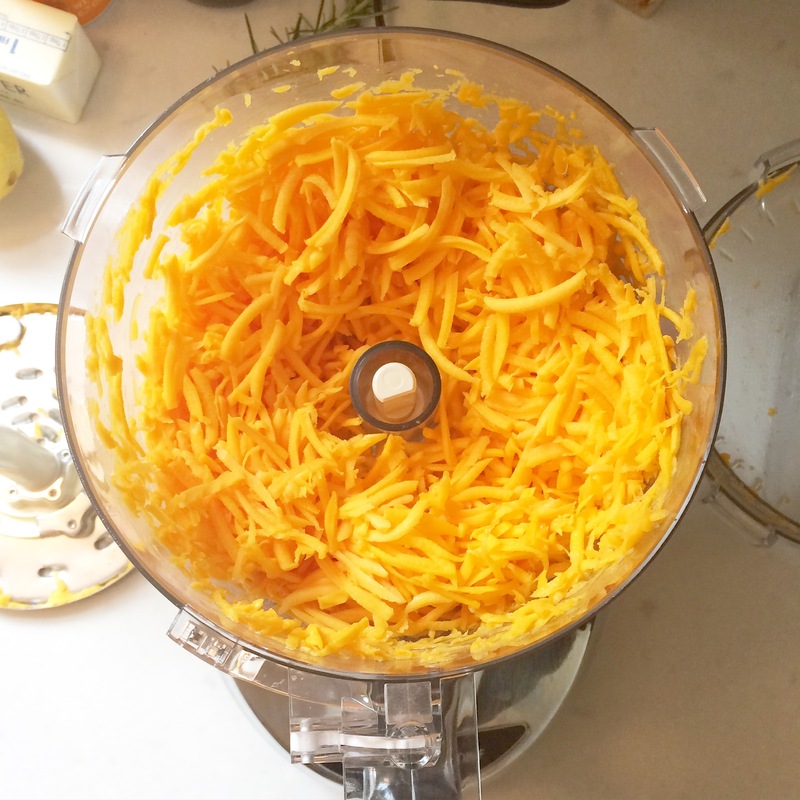 In a food processor fitted with a grating attachment, shred the squash. 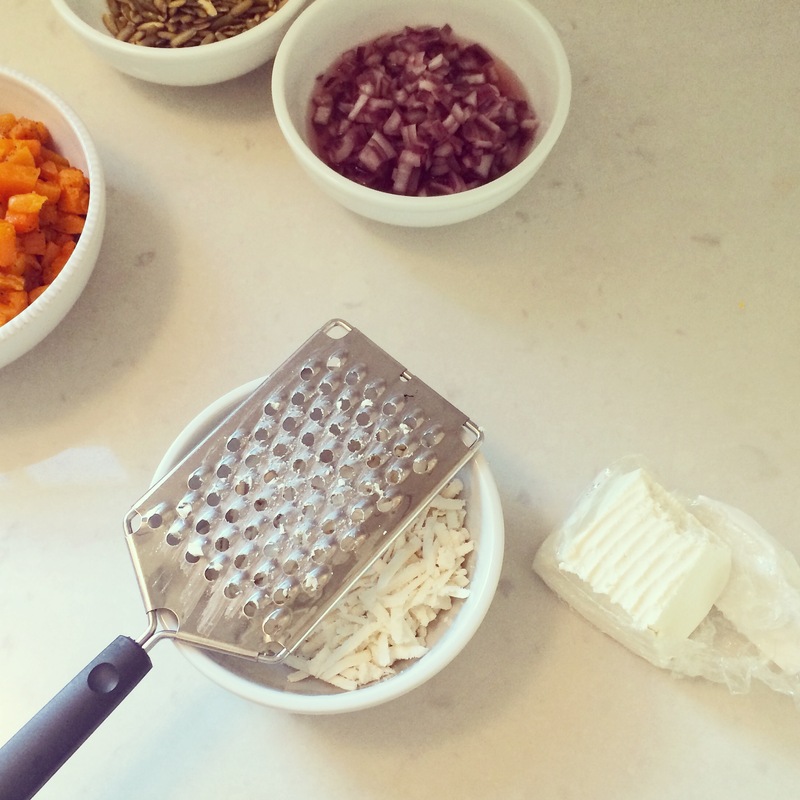 (Or use a box grater, but it will be harder to do. You can also just dice into small cubes, which will taste just fine but won’t dissolve into a sauce like the shreds do). In a small saucepan, bring the stock to a simmer. Melt the butter in a large skillet or dutch oven over medium heat. Add the leeks and cook, stirring occasionally, until soft, about 5-7 minutes. Stir in the garlic and cook until fragrant, about one minute longer. 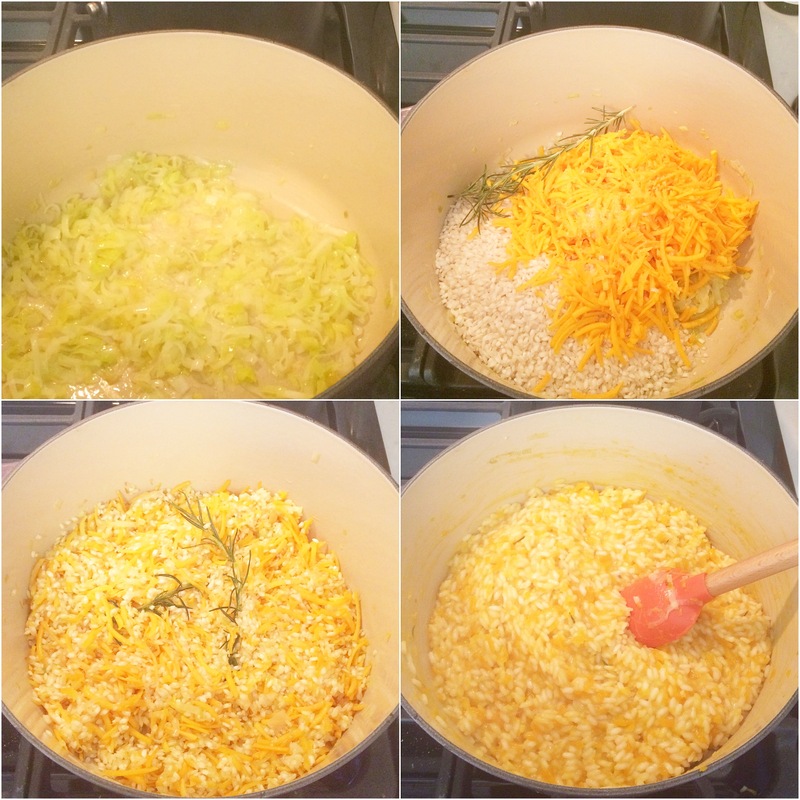 Add rice, squash, rosemary, and salt. 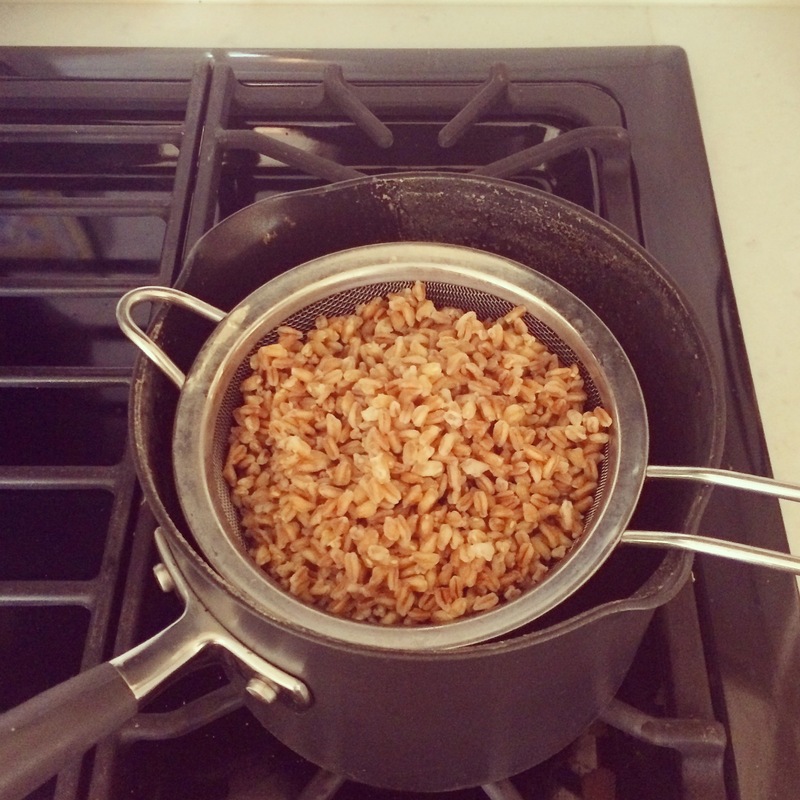 Stir until most of the grains of rice appear semitranslucent, 3-4 minutes. This means they have absorbed some of the fat from the pan, which will help keep the grains separate as they form their creamy sauce. 2. Pour the wine into the pan and let it cook off for about two minutes. Add a ladleful of stock (about 1/2 cup) and cook, stirring constantly and making sure to scrape around the sides, until most of the liquid has evaporated. Continue adding stock, one ladelful at a time, and stirring almost constantly until the risotto has turned creamy and thick, and the grains of rice are tender with a bit of bite, 25-30 minutes (Melissa says you may not need all of the stock, although I found that I needed more – my risotto was creamy after the 6 cups were used up but the rice was still a little too crunchy – it needed a couple more splashes of stock and five more minutes on the stove). Remove rosemary stems and stir in lemon zest, lemon juice, and black pepper. Taste and add more salt and lemon juice if needed (mine needed both). Garnish with the pistachios and optional cheese before serving. 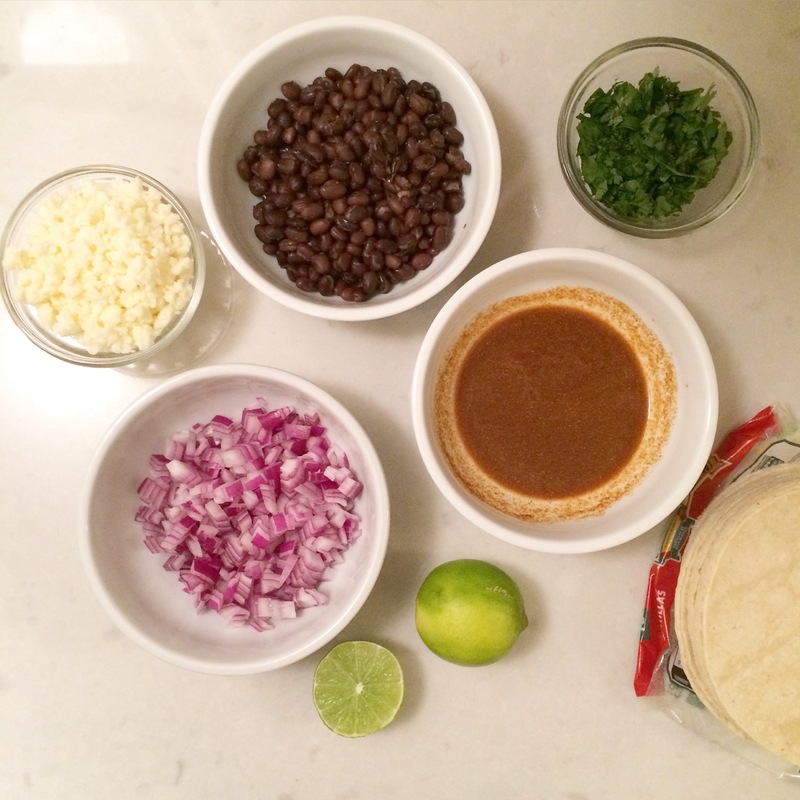 I’ve had my Smitten Kitchen cookbook for almost three years now, and these tacos have been on my to-make list since the day I got it. Smitten Kitchen is one of my very favorite blogs, as I’ve probably mentioned at least a few (hundred) times already. We had been anticipating her book for months before it finally came out in October of 2012, and I was certain I would cook my way through it immediately. But I guess life (and keeping up with her blog recipes) got in the way, as I just did a quick tally and realized that out of well over 100 recipes, prior to this one I had only made eight. Eight! In three years! They’ve all been delicious – corn risotto-stuffed poblano peppers, white bean and swiss chard pot pies, the pumpkin gingersnap cheesecake tart, perfect pie crust, cherry-almond galette, peach dumplings with bourbon hard sauce, apple cake, and blueberry cornmeal coffee cake – but eight seems like way too few considering there are about 10 times that on my to-make list. (And please note that six of the eight have been from the “sweets” section of the book – busted!). 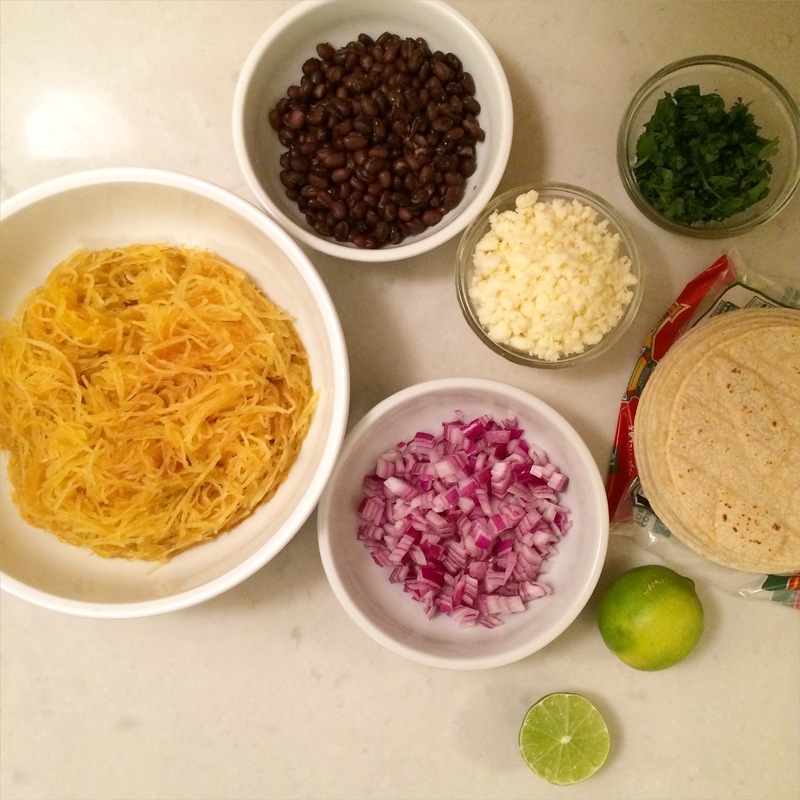 Along with her peach and sour cream pancakes (yum) and butternut squash and caramelized onion galette (double yum), these tacos were on the top of my to-make list, so when my cousin brought me three gorgeous spaghetti squash (squashes?) from her garden last week I knew exactly what to do with them. I love squash in mexican food – the Cactus Butternut Squash Enchiladas are my all time fave – so of course this recipe was calling my name. I also love the combination of black beans and squash (like in this soup or this casserole) – I don’t know exactly what it is about this particular combo, but somehow it’s one of those instances where the whole is better than the sum of it’s parts. 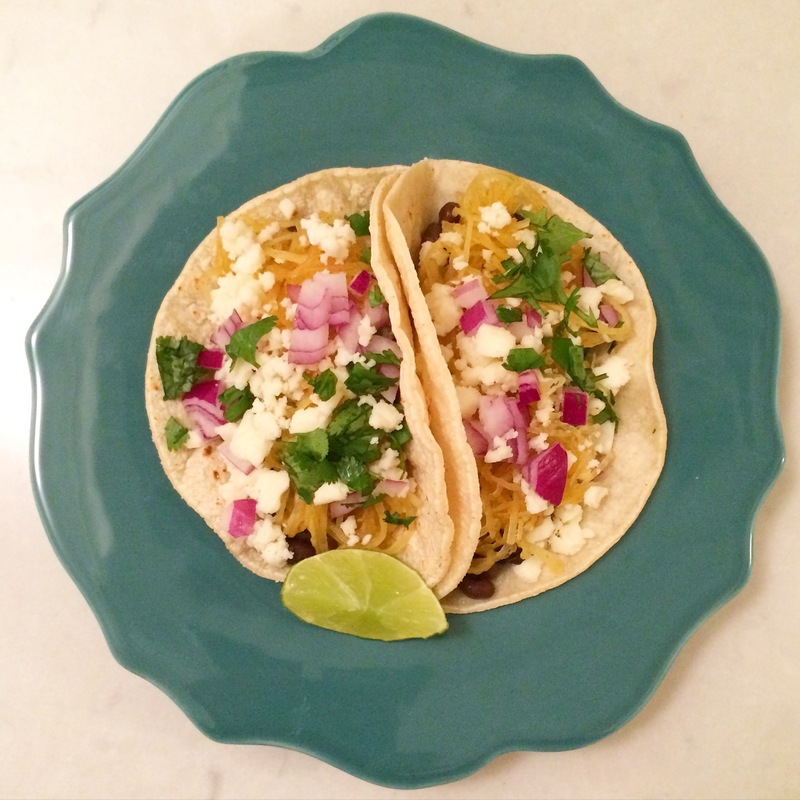 And that is definitely the case with these tacos, as I find spaghetti squash on it’s own a little blah. Additional reasons I’ll be making this a lot this fall: it’s pretty healthy, and couldn’t be easier. It takes 40 minutes to roast the squash (although you could do it in less than half that time in the microwave), but aside from that it takes about ten minutes to throw everything together, so it’s the perfect weeknight meal. While the squash is cooking, whisk your lime juice together with the seasonings, open a can of beans (I warmed mine on the stove because I don’t love the idea of eating things straight out of a can, but you don’t have to so long as you drain and rinse them well), dice up a little onion, chop some cilantro, and crumble a bit of queso fresco or cojita cheese. 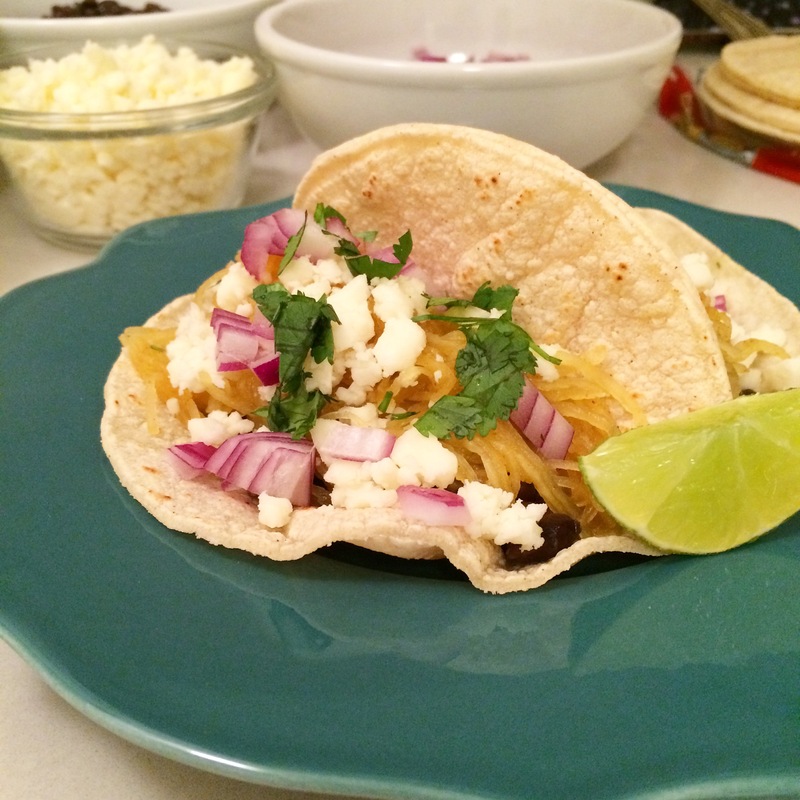 Deb uses queso fresco (not only in her tacos but in the title of the recipe) but says you could also use cojita or feta – I used cojita because it’s my favorite, but the other two would be great as well (and less expensive!). 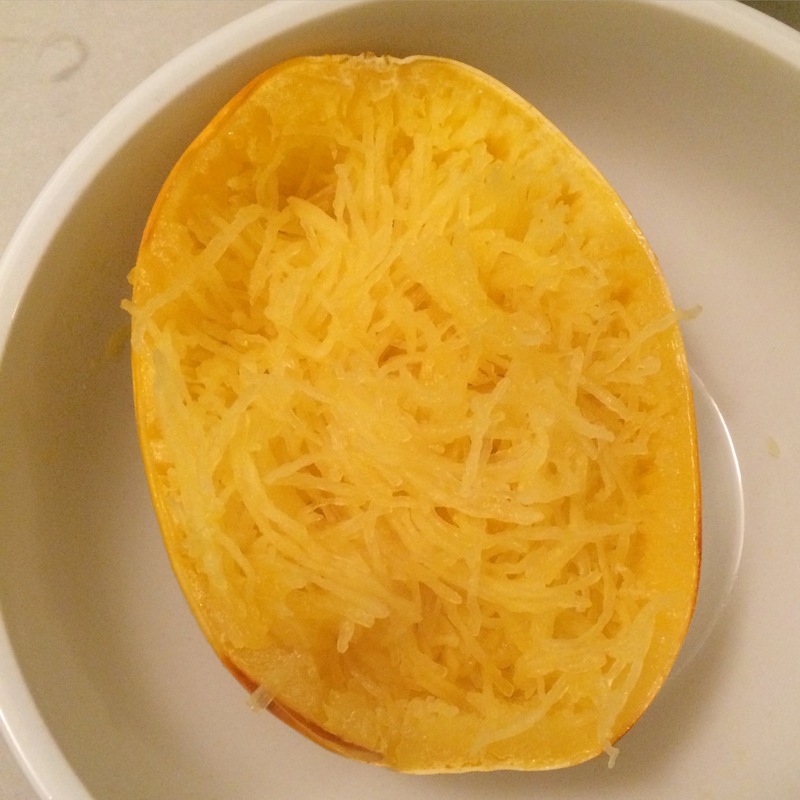 Once your squash has finished cooking and has cooled slightly, use a fork to scrape it out of the skin into long, stringy spaghetti-like strands, toss it with the lime juice mixture, and you have a delicious and healthy meal ready to go. The tacos look gorgeous once assembled, and if you have leftovers (which you likely won’t; I did only because I doubled the recipe and was serving a small group), they’ll keep for a few days. I stirred any leftover beans and toppings into the remaining seasoned squash and will have yummy lunches for the next few days – leaving me more time to get to work on my SK Cookbook to-make list. I’m thinking pancakes for dinner tomorrow! 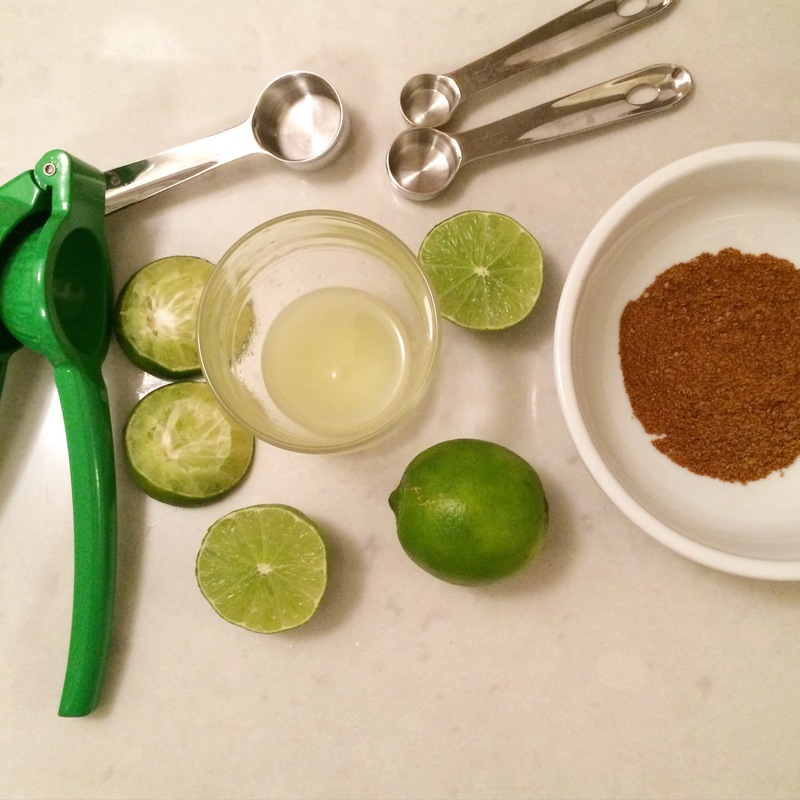 In a small dish, whisk the lime juice with the chili powder, cumin, coriander, and salt. Pour over the squash strands and gently toss it all together. Taste and adjust seasonings as desired. 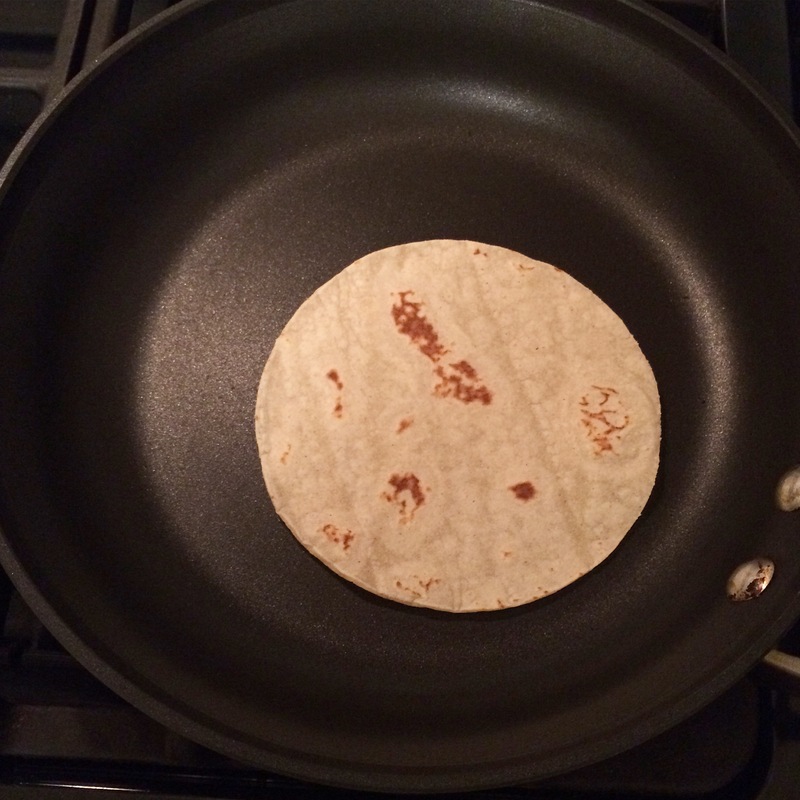 To assemble the tacos, heat a dry skillet over medium-high heat and warm/slightly blister each tortilla, about 30 seconds per side (I sometimes run mine under the broiler, which always seems more efficient as you can do 6 or so at once – but occasionally I do burn them so perhaps Deb’s way is better). 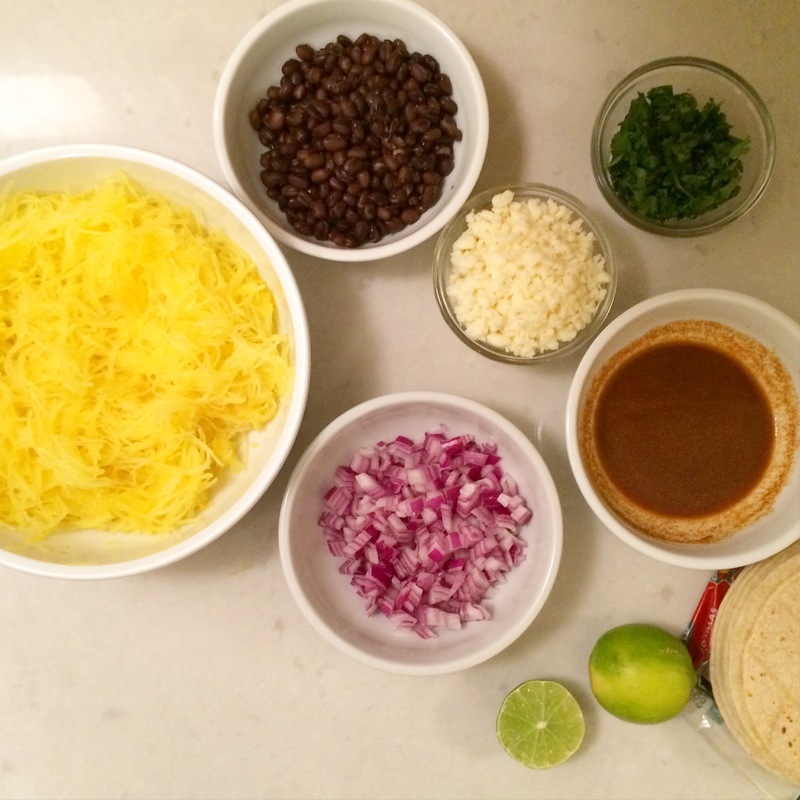 Fill each tortilla with two tablespoons squash mixture, two tablespoons black beans, two teaspoons crumbled cheese, and a couple pinches of onion and cilantro. Serve with lime wedges and hot sauce (if hot sauce is your thing – it’s not mine). I know that by February I’ll be longing for a warm and sunny October. OK, by November (which is only 22 days away, eeeek!) I’ll probably be longing for a warm and sunny October. But as of this week, when the 70+ degree temperatures are keeping me from my new fall wardrobe, I’m really ready for it to start feeling like fall. I’ve dug all of my sweaters and boots out of the back of my closet(s), but it’s been t-shirt and flip flop weather all week (the things I find to complain about, I know). I’ve decided, however, that even if the forecast points to an Indian summer, the calendar says fall, so that’s what I’m going with. I colored my hair dark this week (!!! ), bought a flannel shirt that’s way too hot to wear anytime soon, and started in on the “fall recipes” on my to-do list. First up, this yummy butternut squash salad from Smitten Kitchen. 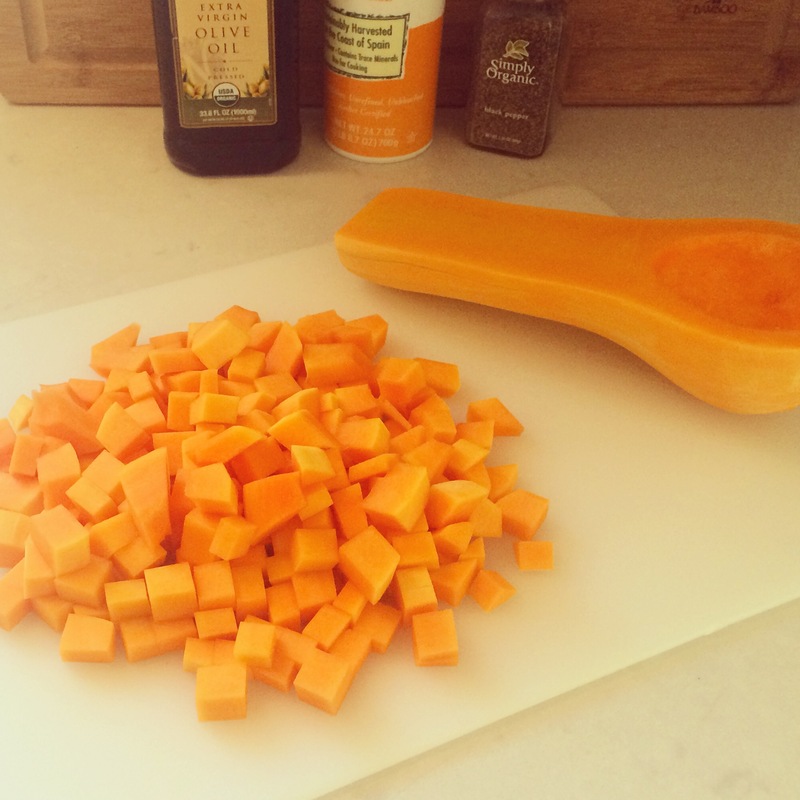 Is there anything more “fall-ish” than butternut squash? (Is “fall-ish” even a word?) 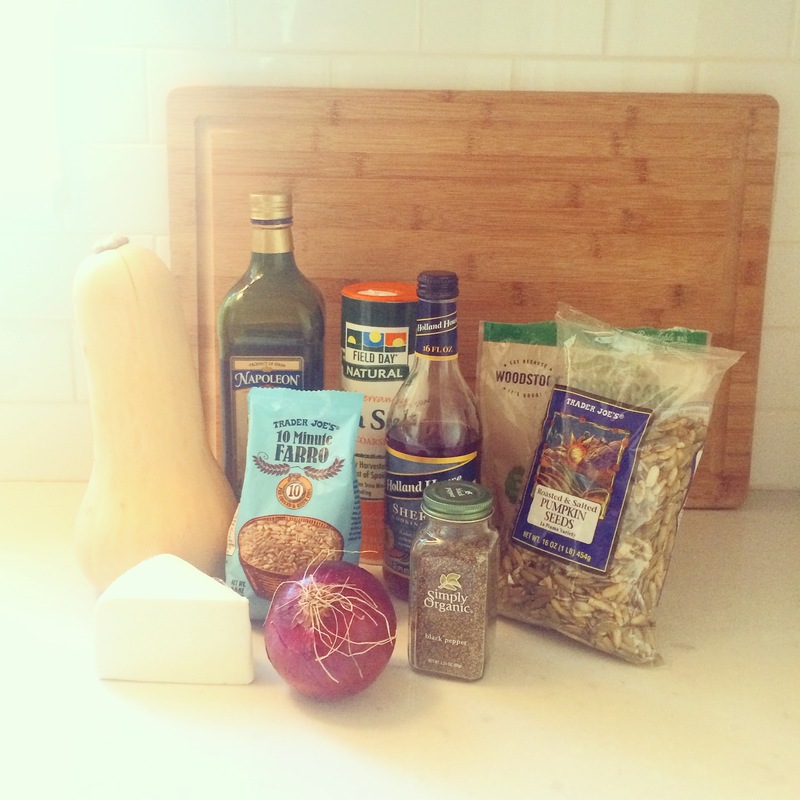 Well, there are probably lots of things, but butternut squash has got to be up there. After I made this salad, I found this one and kind of wished I had made it as well. If you’re really on top of life, you could prep a big batch of squash ahead of time and use it for both recipes (it will keep either raw or roasted in the fridge for a few days at least). You could throw it into a pasta dish, or into a green salad, or just eat it plain with parmesan like I’ve been doing a lot lately (yum). But for now we’re talking farro, which is delicious (and pronounced FAR-ro, not FAIR-ro like a Pharaoh from ancient Egypt. I may or may not have been mispronouncing this word for entirely too long, so just want to save you the embarrassment in case you’ve been making the same mistake). Deb explains the difference between pearled, semi-pearled, regular, etc., and the corresponding cooking times. 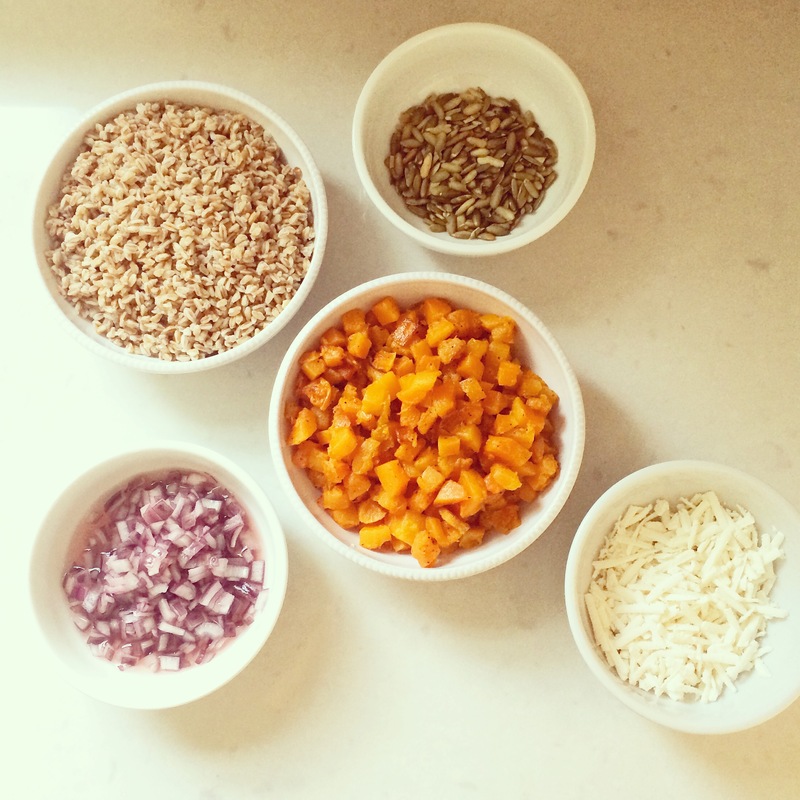 I just bought the Trader Joe’s “10 minute farro” and it was great (TJ’s FTW, as usual). My only other notes would be: (1) Deb recommends you pickle your onions for as close to 30 minutes as possible, but tells you that if you don’t have that much time less is ok too. I’m sure she’s right, but as a raw-onion-hater I’ve found that the longer the onions are marinating, the less raw-onion-y they’ll taste. When I have time, I let mine sit in the fridge for an hour or two (fun tip: even soaking slices of red onion in plain ice water for a few minutes makes them taste a little more neutral). Of course if raw onion hatred isn’t an issue for you, 30 minutes or less is fine. 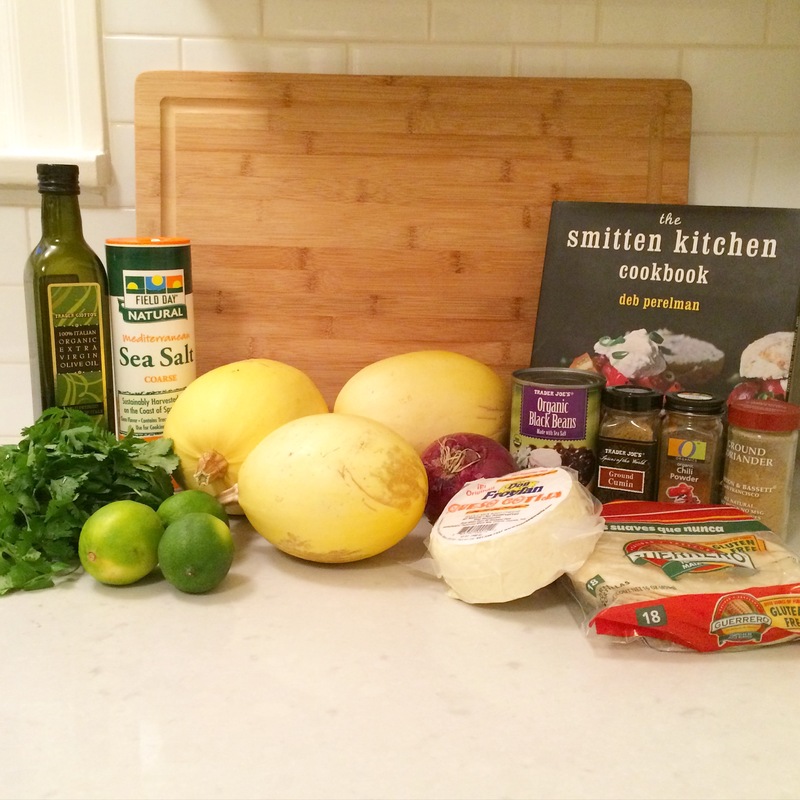 (2) Sometimes ricotta salata can be hard to find – I’ve used feta in the past and it works just as well. This is probably blasphemous to write on a food blog (however wannabe it may be), but I’m not entirely on the ricota salata train in the way that everyone else seems to be and I almost like it better with the feta. 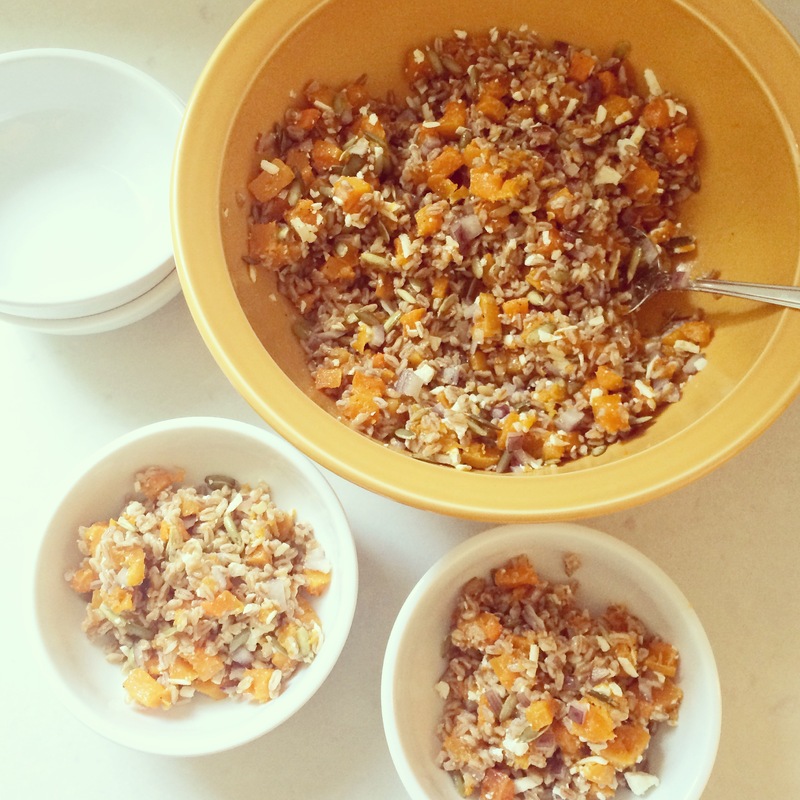 (3) Deb will tell you this as well, but this salad is super flexible – use any type of squash or roasted veggie in place of or along with the butternut, use rice/orzo/barley instead of farro, etc. Although if you don’t have an aversion to anything in the recipe, I would encourage you to try it as written at least initially, as it really is delicious. 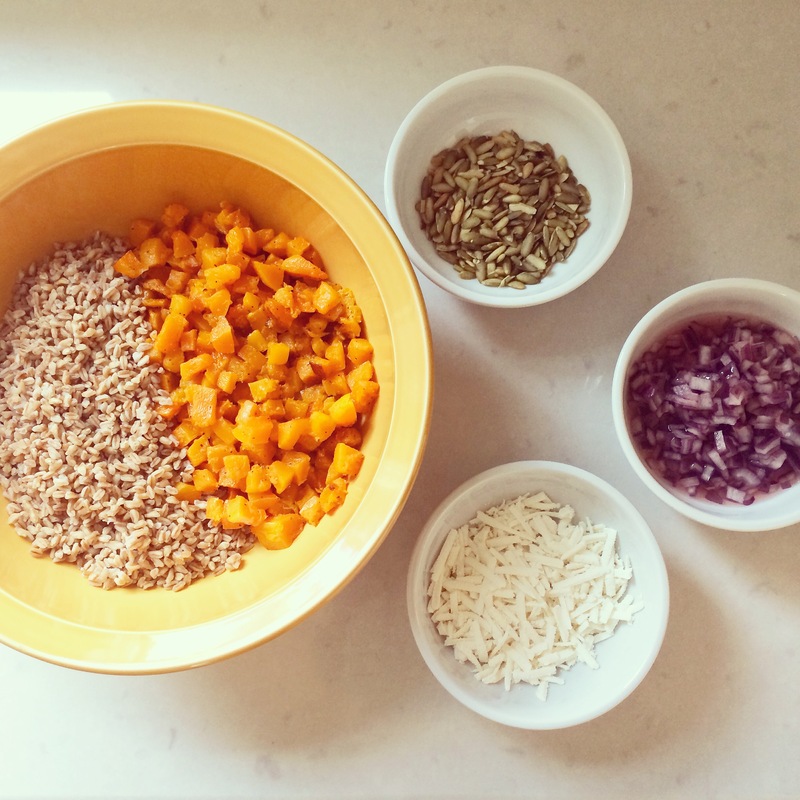 Ratios are also flexible – I just used a whole squash, an entire (small) bag of farro, and then adjusted my toppings and seasonings accordingly. (4) This salad is good at room temperature (i.e. when you’ve just finished making it and the squash and farro are still warm), but delicious chilled – it’s one of those salads that is really better the next day (especially if the next day is a little closer to sweater weather). 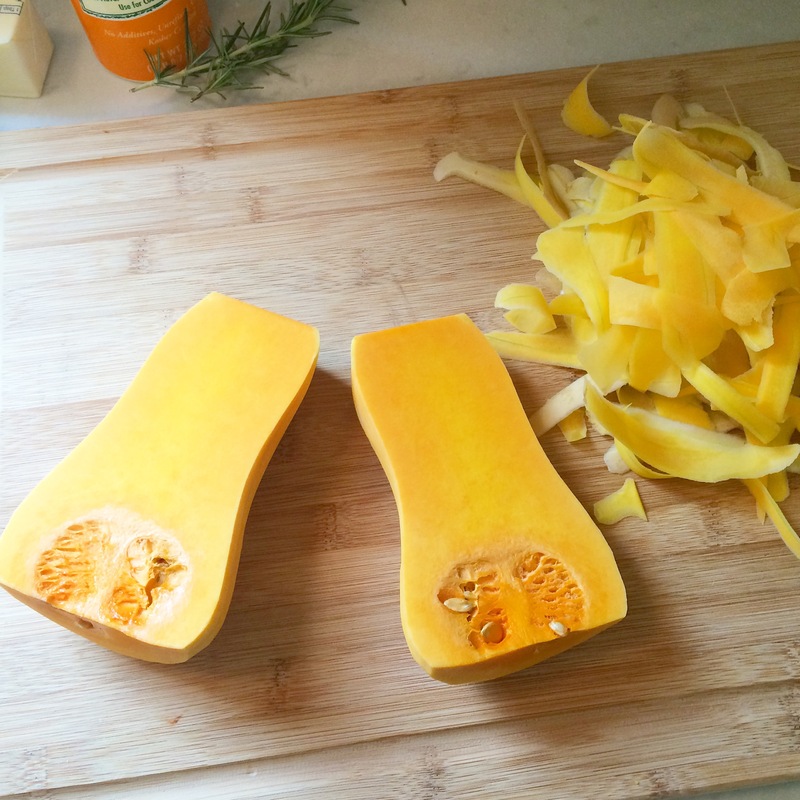 Prepare Squash: Preheat oven to 375 degrees F. Peel butternut squash and scrape out seeds. 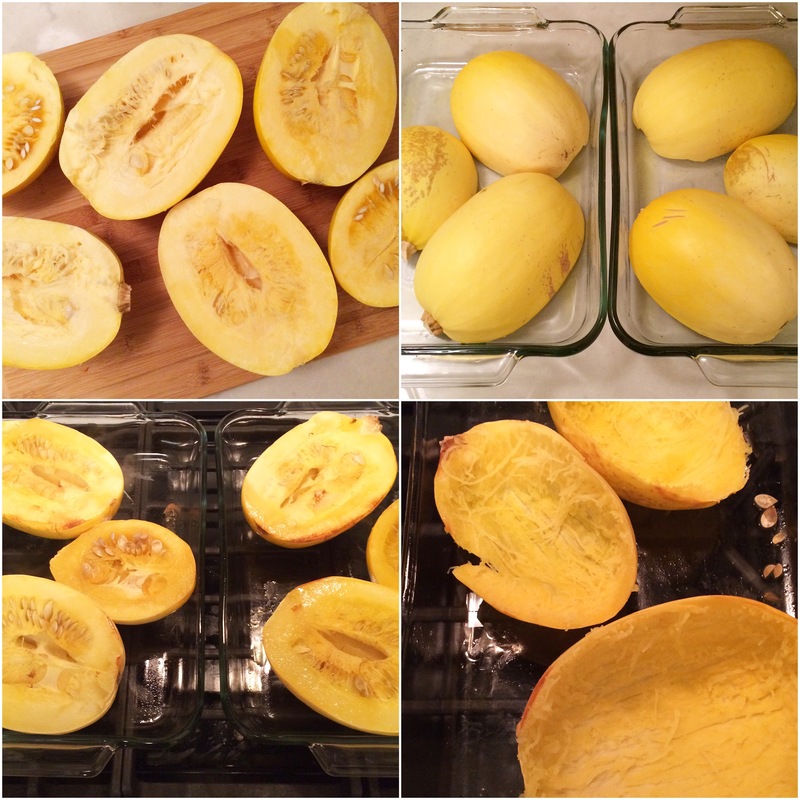 Cut squash into 1/2″-3/4″ cubes. 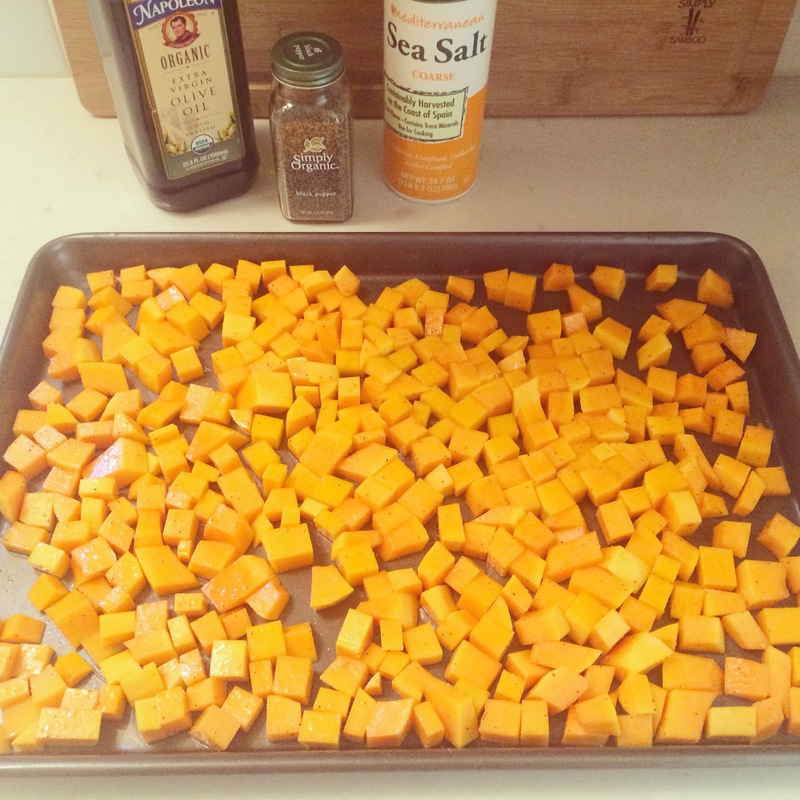 Coat baking sheet (or sheets, if you have a large amount of squash) with olive oil, and then toss squash on the baking sheet with small amounts of olive oil, salt, and pepper until coated. Roast 30-40 minutes, or until squash is tender and starting to brown, tossing or stirring a couple times so that the pieces don’t stick. Prepare Farro: According to package instructions. 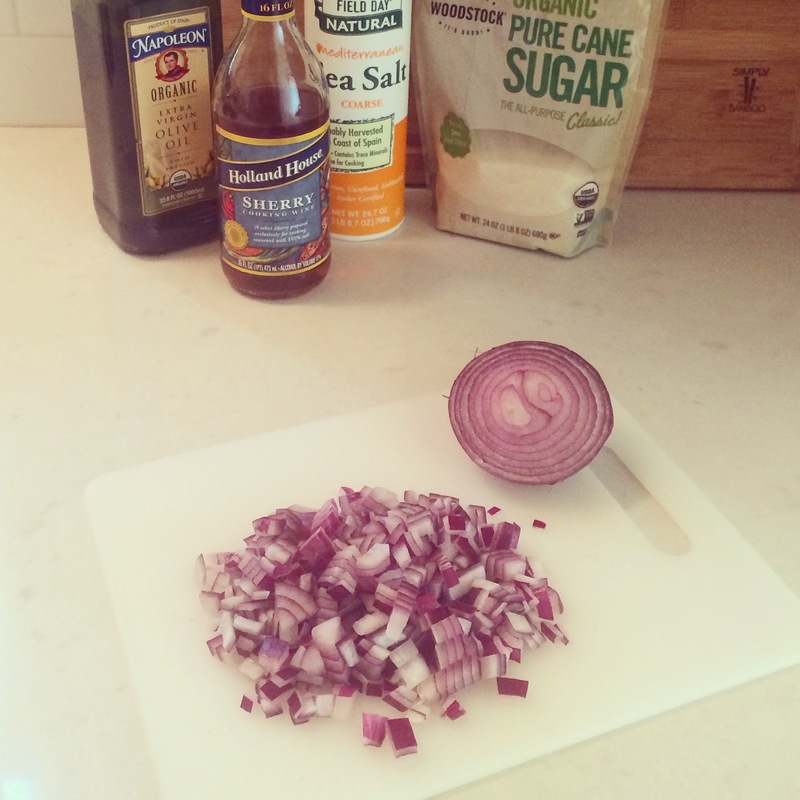 Prepare Onions and Brine: Chop onion into small dice. 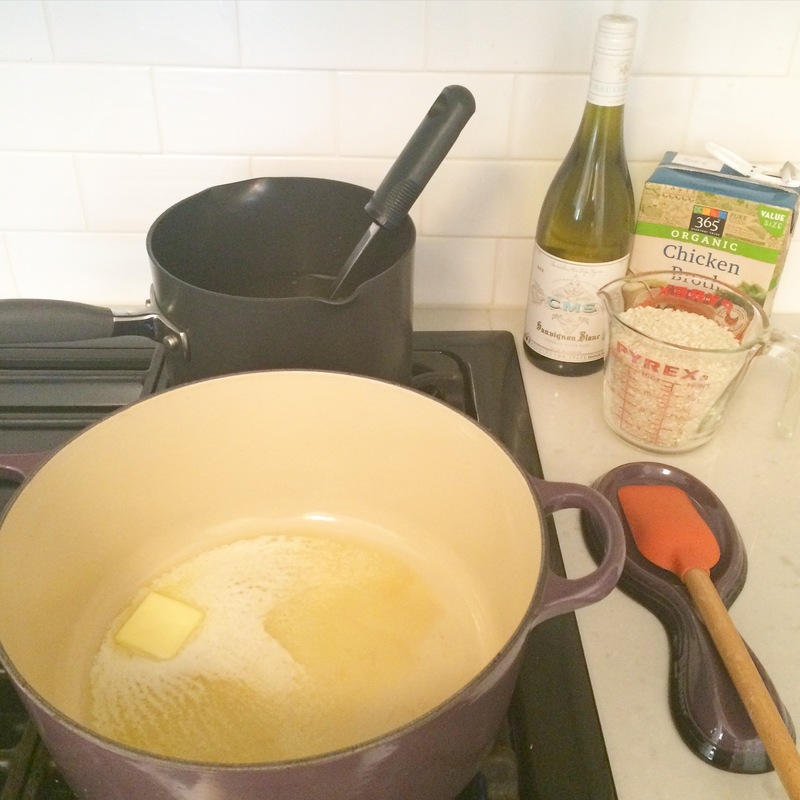 In a small bowl, whisk together the sherry vinegar, water, sugar, and salt, until the sugar is dissolved. Add onion and stir to coat. The brine won’t cover the onions all the way, but that’s ok. Place onions (in brine) in the refrigerator while you wait for squash/farro to cook. Ideally they can chill for 30 minutes, but less time is ok. 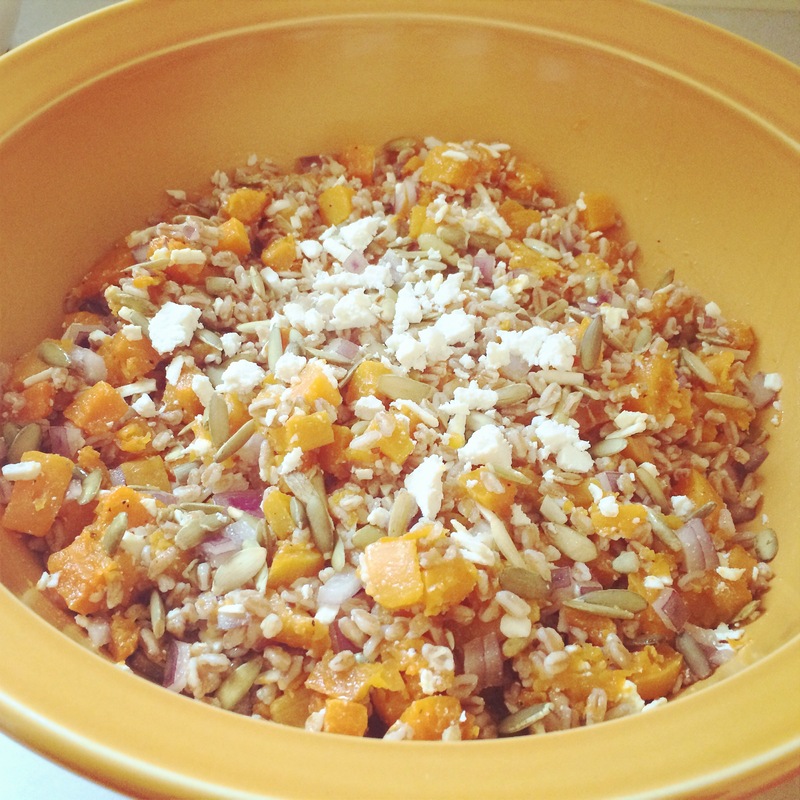 In a large bowl, mix together farro, squash, onions (with brine), cheese, and pepitas. Add three tablespoons of olive oil. Taste, and add more oil, sherry vinegar, salt, and pepper to taste. Top with more cheese and/or pepitas if desired (I did). Salad is best chilled, and will keep in the refrigerator for up to a week.